Bill McFarlan is co-founder and co-owner of Pink Elephant Communications. As Executive Chairman, he oversees the unique style of training that has taken the company all over the world. 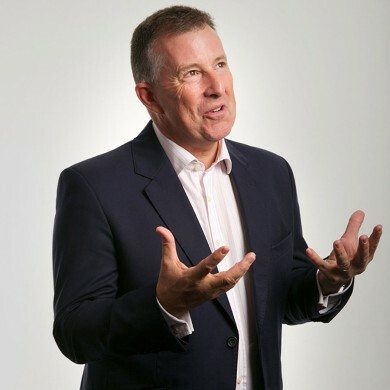 He leads more than 100 training courses each year – helping clients deal with everything from job losses and product launches to undercover investigations by Panorama. His Pink Elephant Communications career has taken him to the United States, Caribbean, Africa, Middle East, Asia and across Europe. And his highlight? Leading the presentation skills training that concluded in Glasgow, Scotland, winning the Commonwealth Games for the city in 2014. His knowledge and expertise are based on a quarter of a century helping blue chip companies get their message across. He spent almost as long as a presenter with BBC, Scottish Television, Sky and Setanta – where he anchored news and sports programmes from the early 1980s to 2004. BBC Breakfast News, Reporting Scotland, World’s Strongest Man, Grandstand from Scotland, Sportscene, Scotland Today, Scotsport, The Golf Club – Bill presented them all. So he knows what it takes to get your message across in the media. He’s a regular conference speaker across the UK, Canada, the United States and Australia. He can give you the inside track on overcoming nerves, exuding self-belief, and inspiring an audience. Well, more work! With his wife, Bill helps entrepreneurs start their own businesses through a network marketing company. To unwind he plays golf, squash, tennis, and more golf. He travels extensively…or just soaks up the sun in Portugal.